Today, we started out in one of the best ways we could, sleeping in late! 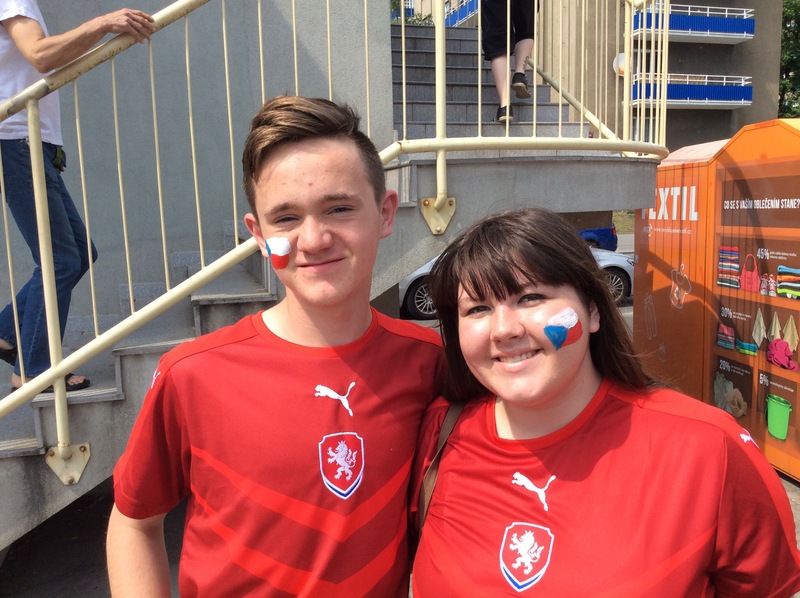 After which, of course we started getting ready for our big Czech v South Korea football game. Geared up and ready to the go, we arrived in matching jerseys and full of spirit for our adopted team. Unfortunately, they fought hard, but came up short with a a 1-2 loss. After the game we headed over to the Tallman’s apartment for cake and a Q&A with her parents about their lives before, during, and after the communist occupation. What I found most interesting was their details of everyday life. Exotic fruit like bananas and oranges weren’t available at all if you didn’t have connections, and only on very very special occasions if you did, and toilet paper was so unheard of that Mrs. Tallman’s mother actually laughed when asked about the quality of paper products. That there was no toilet paper, and that newspaper was used in its place, was, perhaps, one of the most shocking things for us to hear. Education was also affected by the occupation. History was taught with alterations, government classes preached propaganda and Russian literature and language was required for all students. Mrs. Tallman’s father demonstrated the power of his education with an ironic performance of a Russian poem he had to learn in grade school. Even Mrs. Tallman’s parents’ first meeting was affected by, or really because of, communism, as they first met while on a state regulated vacation. The cake was lovely, but Mrs. Tallman’s parents were even lovelier and told their stories compellingly and humorously, giving us a brief glimpse into the fascinating lives they’ve lived.